Bathing a baby is a fun and enjoyable experience both for the mom and the baby. But for a new mom, bathing a baby is not easy. There are so many questions that come to mind and most new moms are unsure and tensed on how to handle new born babies while bathing. I too had apprehension about how I would bath my new born baby, but luckily for me my mother and mother-in-law were by my side and taught me how to bath my daughter when she was born. But most women do not have this opportunity as they live in nuclear families or are away in some other state or country. In that case, mothers have to deal with this situation alone. 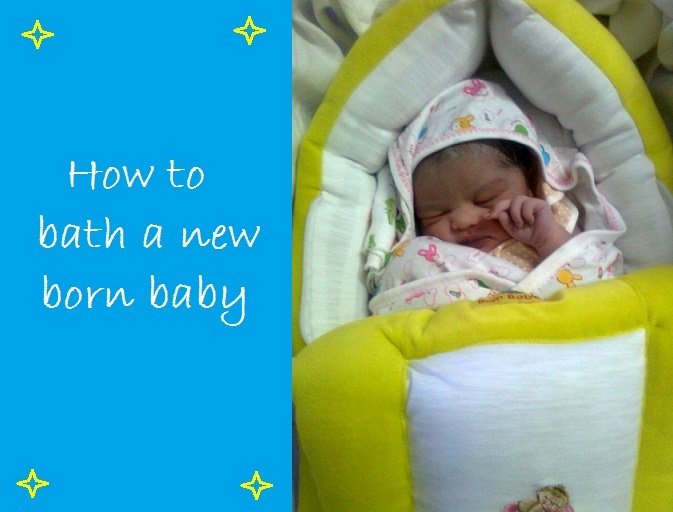 So I am sharing a few tips here which would help you in bathing your baby. It is always better to learn how to bath a baby from an experienced person beforehand so that you will feel confident when bathing your baby for the first time. You can video call your mother or relative and ask the to give a demo or you can get help from your neighbour. Usually most people in India bath babies by sitting on a short stool and placing babies on their legs and giving them a quick bath. You can follow this if you have seen someone bathing children earlier or have tried this yourselves. In case you are not very confident with using the above method, you can buy a tub and a holder that are easily available in the market which are perfectly suitable for bathing new born babies. The holder holds the baby in place and we just have to hold the baby with one hand and use the other hand for applying soap or pouring water. Some babies cry when you apply soap or pour water over them so keep a rattle or toy ready or try making faces to keep them in good spirits. Always use soaps and shampoos which are specifically made for babies. Keep the soap, shampoo, towel and everything ready before you bring your baby to bath. The bathing process has to be short so that your baby does not catch cold. Always bath your baby with lukewarm water. Test gently by pouring some water over their hands or legs. If they show any discomfort adjust the water according to their wishes. But do not bath them with cold water. Once done, quickly wrap the baby with a towel and bring her to the room. Nicely rub with a towel so that no water remains. Clean the nostrils and ears gently by rolling the corner of a thin towel, apply baby powder and dress them up.